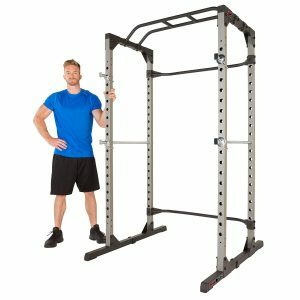 Buying equipment for your home gym is exciting! 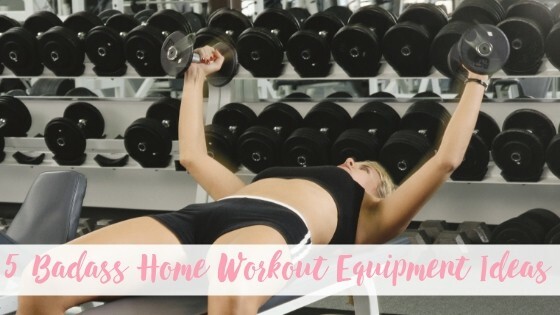 When you begin thinking about home gym equipment ideas to enhance your workouts, it’s a good idea to start small and build your home gym over time. There’s no need to buy a bunch of expensive pieces or a bunch of stuff at once if you’re not sure you’re going to stick with it. But for the sake of this post… of course you’re gonna stick with it because I think you’ll really fall in love with lifting weights. If you don’t read to the bottom, just know that I would highly recommend shopping on Amazon because they have their own Amazon Basics brand and most things are less expensive and they’ll ship FREE if you have Prime! If you follow Britney Spears on Instagram you may have seen them because she’s posted workout videos of her using them in the past. Click here to see the current best-selling barbells on Amazon. A weight bench is a must-have if you don’t want to lay on the floor. I know whenever I lay on the floor, boom! All the dogs are suddenly right. in. my. face. A bench will enhance your workouts because it allows you to have a greater range of motion when you’re doing chest exercises. Click here to see the current best-selling weight benches on Amazon. 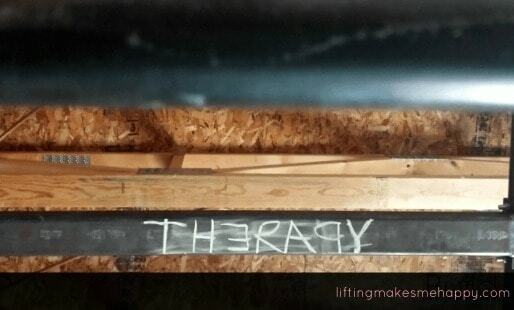 My husband is a welder and he actually built our squat rack himself. It’s very basic and it was really cheap because he just had to pay for the material and then also the time it took him to build it. It’s simple but we love it and it lets us do a lot more than we could before we had it! It’s a good reminder on the tough days! Prices on home squat racks have come down quite a bit since we built ours in 2010. If you don’t want to bother with building one, they’re a lot more affordable right now. We spent about $100 for all the material used and you can buy them starting at about $150. 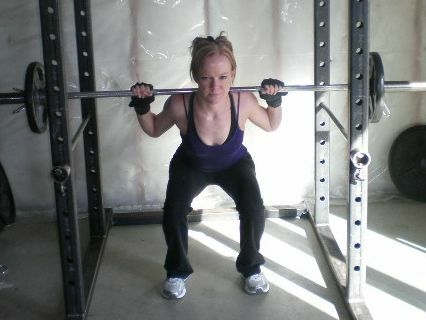 I would prefer an actual squat rack — especially since they aren’t much more expensive than the stands and I definitely think they’re safer! But of course it also depends on how much space you have to work with. 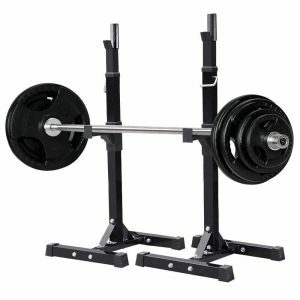 Click here to see the current best-selling squat racks (or power cages) on Amazon. I probably should’ve listed these first but I really had to start with the barbell. You may or may not have dumbbells at this point but if you don’t I’d definitely recommend buying these first. 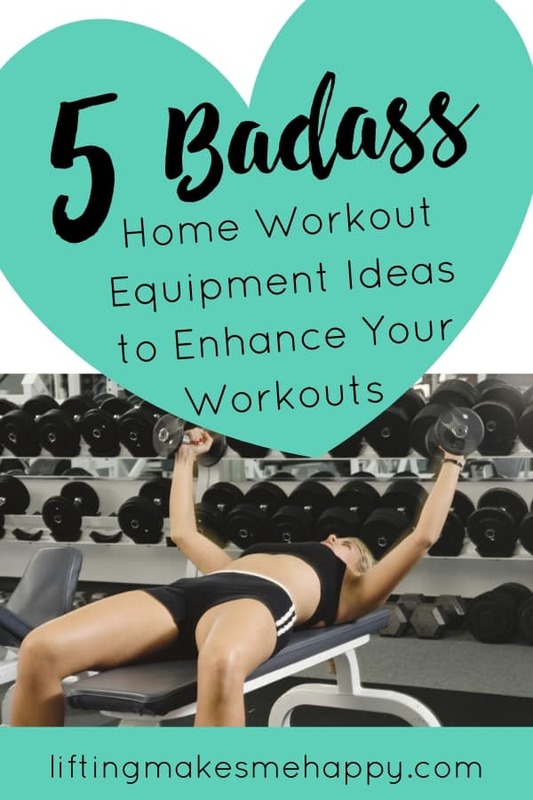 We have sets of each kind and the ones we use the least are the rounded ones; my husband uses hex dumbbells the most and I use the Bowflex dumbbells most. The adjustable dumbbells are really nice to save on space but if you’re doing a workout where you need to change the weight quickly, adjustable dumbbells can be pretty clunky. The colorful ones are fun but the material does start chipping off or wearing off after a while and if you stack different colors together the colors can transfer. Dogs also like to chew on them because of the rubber or vinyl material! Ask me how I know. Ha. Also, the Bowflex ones are awesome but they’re pretty long so they can be awkward for some exercises. I’d also recommend always buying them in pairs! When I started working out we had a few hex dumbbell sets and the lightest was 10# which was too heavy for me at the time for arm and shoulder exercises. I ended up buying a pair of 5’s and 8’s. If you need to, you could always visit a store and play around with various weights to see what you think might be best for you. Click here to see the current best-selling dumbbells on Amazon. If you just don’t have the room for a squat rack or bench, kettlebells are a great way to enhance your workouts too. You can do so many different exercises with them and you really only need to buy one. They can make workouts feel new and exciting again if you’re getting bored, too. 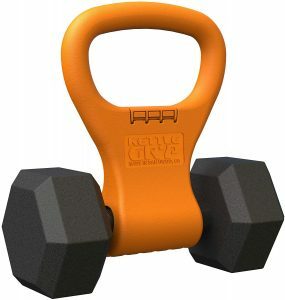 If you want to save money, you could buy a KettleGryp to use with your existing dumbbells! Whoever created this is a damn genius. It lets you turn any dumbbell into a kettlebell. You can also use dumbbells as a kettlebell but kettlebells are more fun! I bought my very first kettlebell on clearance at Target. Then I got a Demonbell for Mother’s day a few years ago. She’s my favorite! Yes, she’s a she. Sadly, it looks like they don’t make these anymore. It weighs 70 pounds! 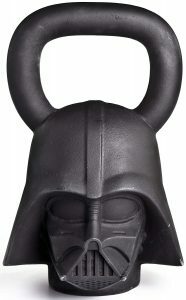 Could be used for decoration in your workout room if you don’t wanna swing this beast around, haha. With my luck, I’d drop it on my toe. They also have a Stormtrooper (60 pounds) and Boba Fett (50 pounds). Fun, right?! I am not a Star Wars fan (gasp!) but I still think these are pretty cool. If they had a bulldog face one I’d totally buy it. Click here to find a current list of the best-selling kettlebells on Amazon. You can also check out my kettlebell workouts Pinterest board for more ideas! You definitely don’t need every single item I’ve listed here but they will all enhance your workouts! I know it’s not always easy to find space for the larger items like a squat rack and a barbell, but if you can make room I’d really recommend it. I think you’ll love how powerful they will make you feel!